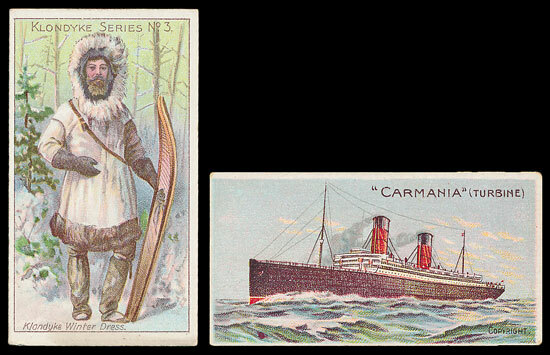 The cigarette card section of the sale opened with the collections and mixed lots with strong bidding from the start. Lot 1 contained a range of better part sets and type cards by Cope, E.R.B., Hill, Hudden, Ray and others and sold for £630 against an estimate of £450. Lot 2 contained complete sets by Carreras, Faulkner, L & B, Mitchell and others was estimated £350 and realised £550, a lot containing complete and part sets by Allman, Cope, Gallaher, Lea and others estimated £350 made £630, a collection of complete sets by Churchman, E.R.B., Faulkner, Lloyd, Moustafa and others estimated £350 realised over £800 and a range of complete sets in plastic sleeves by L & B, Player, Sinclair, Wills and others achieved over £500 against an estimate of £330. 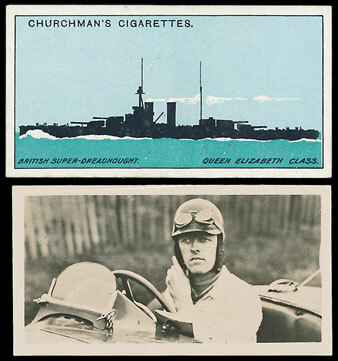 A fine selection of individual sets began with a Churchman Silhouettes of Warships set estimated £120 realising £180. A Davies Flags & Funnels of Leading Steamship Lines set estimated £100 made £156, a Drapkin Sporting Celebrities set including the Seagrave card realised over £260, a Hignett Music Hall Artistes set in good condition estimated £200 realised nearly £350 despite one being creased and a Pattreiouex Maritime Flags set estimated £100 realised £144. A selection of 310 Phillips Footballers large cards estimated £600 realised an excellent £1380, a Singleton & Cole Atlantic Liners set realised nearly £170 despite 2 being creased, a Smith 1912 Cricketers set in good condition estimated £120 made nearly £200 despite most having some wear, a Taddy Klondyke Series set in good condition estimated £250 realised nearly £400 and a Wills 1896 Cricketers part set of 20 cards achieved over £500 despite some faults. 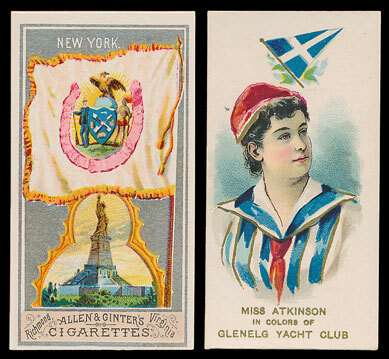 A small section of foreign sets had some notable highlights, including an Allen & Ginter small range of part sets realising £660, a Dudgeon & Arnell Australian Test Team set estimated £50 made £60 and a Duke Yacht Colours of the World set achieved £360 against an estimate of £250. The mixed trade lots again proved popular with many collections selling far in excess of their estimates. A large mixed accumulation featuring sets by A. & B.C., Barratt, Chix, Thomson others realised £480, a range of complete and part sets by Amalg. Press, Barratt, Boys Magazine, Jibco and others estimated at £130 made nearly £230 and a range of complete and part sets by A. & B.C., The Rocket, Thomson and others estimated £120 realised over £200. Individual trade sets also did well. An A. & B.C. 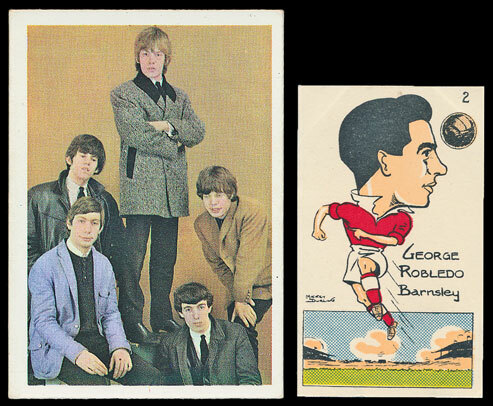 The Rolling Stones set estimated £80 realised £216 despite several with writing in ink to the backs, a Mickey Durling Footballers of Today set estimated £60 realised £108, a range of Liebig Menu cards in mixed condition made £720 and a Whitbread Inn Signs Marlow set sold for £78. Our next auction is on Wednesday 15th May 2019. 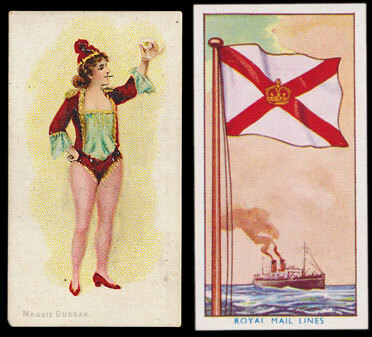 We will again be offering a large selection of collections and mixed lots alongside an array of British and foreign cigarette card sets as well as a selection of trade cards.